Daily Meal Magazine asked Dr. Kantor to give his input on President Trumps eating habits…. President Donald Trump is known for many things but we have no real idea about how he eats, or his overall nutrition status. His doctor reported that he was healthy and it’s obvious that he has energy, so he must be doing something right! Like everyone his eating habits are both good and bad. Here is our review of some of President Trump’s eating and lifestyle habits. When he was on his campaign trail his favorite Snacks included Oreos, cherry vanilla ice cream, and the famous See’s candies. Due to the schedule demands and stress of a high profile political campaigning it seems like he was turning to comfort foods often. The sugary snacks above were not doing anything to improve his health, in fact they were sending him on an insulin roller coaster of energy highs and crashes. Instead fresh fruits and vegetables along with healthy fats from nuts, seeds, nut butters or guacamole would have been a much better option. President Trump is not always a breakfast eater, but when he does eat breakfast he enjoys the old faithful well done eggs as his main option. Eggs are a great option for breakfast providing protein, healthy fats and vitamins. Eggs will keep you feeling full for longer than starchy breakfast options, and the fat will also help with mental focus considering our brain is nourished with fats. 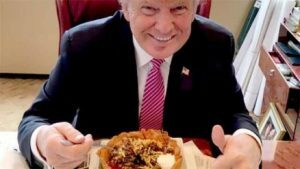 President enjoys eating fast food, in fact he has stated he loves fast food. This is a major problem because fast food is full of chemicals. Hopefully he is eating moderate portions and not upsizing his meals. The average fast food meal contains our daily recommendation in sodium and unhealthy trans fatty acids that can increase risk for heart disease and obesity. I suggest he limit his fast food consumption to only one time per week or better yet every other week. Hopefully the chefs in the Whitehouse are providing him with tasty options that do not come in a paper sack. Trump loves diet coke. Sources report he drinks a lot of Diet Coke. The beverage does not have any calories or sugar but it is full of chemicals. These chemicals have been shown to increase one’s risk for cancer. Studies have shown when Diet Coke addicts shake their habit they lose weight and even report less muscle and joint aches. Trump loves Big Macs, not only does he love fast food, he has named the Big Mac his favorite. This sandwich packs in 550 calories, 29 grams of fat, and 970 mg of sodium. Since fast food is made in bulk and with the cheapest ingredients, the sodium, fat and calories are high. He would be better off with a bun less grass fed burger loaded with veggies. All presidents are at risk for stress related health complications, the comparison pictures of the beginning of their term to the end speak for themselves. Here is a breakdown of some of the health risk that all of the presidents have to face with their demanding and stressful career. Poor sleep quality. This one human truly does have the weight of the world on their shoulders, going to bed with unfinished business can be a recipe for a terrible night’s sleep. President Trump is not living with the first lady full time and he is working all hours of the day, I doubt he is getting the recommended 7-8 hours of sleep per night. Implementing stress reduction strategies like massage, and herbal supplementation may help him improve his sleep quality, lowering his risk for heart disease and an imbalance in cortisol (stress hormone) production. Supplementing with melatonin and magnesium can also increase sleep quality. High Blood Pressure is also a major risk factor for any professional who is in a high pressure-demanding career. Consuming a diet that is lower than 3000mg of sodium per day, and at least 6 servings of fruits and vegetables can help keep his heart healthy. Deep breathing relaxation exercises can also improve blood pressure. Hormone imbalances. When stress levels are chronically high, cortisol production increases, which causes inflammation and major fatigue of the adrenal glands. This process depletes the anti aging hormone DHEA (Dehydroepiandrosterone) and the important testosterone production. Both of these hormones influence lean body mass. If levels are depleted then lean mass will decrease. Daily exercise, quality sleep (7-8 hours nightly) and healthy eating will be the key to their overall success. Nutrition influences energy and the ability to think clearly. Supplements such as hydroxide alkaline water, a high quality multi vitamin, and fish oil can boost the immune system, reducing the chances of getting sick or run down.